Do you know about My Kitchen My World? Each month, they travel to a new location and we cook dishes from that place. Last month was Argentina and this month is Cuba. The group is open to everyone. If you are interested, go on over and leave a comment. There are no requirements as to how often you have to cook. Simply, join in and have fun. Cuban cooking is enjoyable. For me, the word mango is magic and I made two recipes using mango and then made myself Mangolope (a drink I created, blending mango and cantelope). "Cuban cuisine is a fusion of Spanish, African, and Caribbean cuisine." You will find my Caribbean coconut chicken here. Cook first sausage, red pepper and onion in a large skillet over medium heat for 4 to 5 minutes, till sausage is browned. Add garlic, beans, water, oregano and crushed red pepper and bring to a boil. Reduce heat; cover and simmer for 10 minutes. 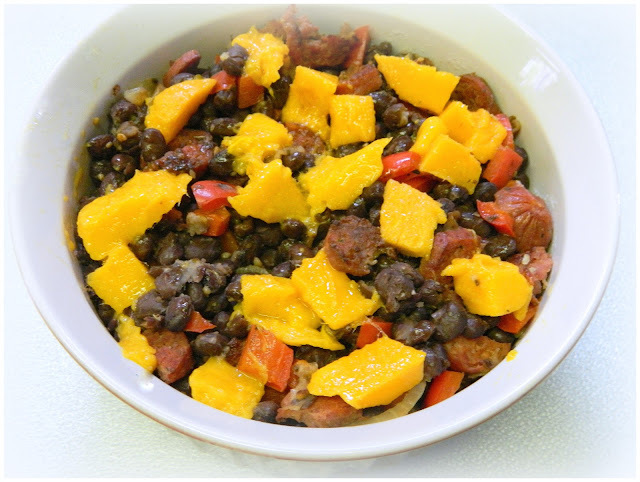 To serve, spoon bean mixture over rice in servings bowls, then top with fresh mango. If desired, garnish with fresh oregano.